In this part, we're going to continue our discussion about how this transformer name is designated with these two methods. In part 7c, we talked about some of these problems that come up with this designation here, the 11. The 11 is our source of confusion. But some of the rules of thumb I have to come to learn will help clear up some of this confusions. So the rules of thumb. The first rule is – when we're comparing this HV winding with the LV winding, we always compare the HV reference quantity (and I'm going to explain this term in just a little while) with the LV reference quantity, when determining the phase shift. So let me make this a little bit smaller. 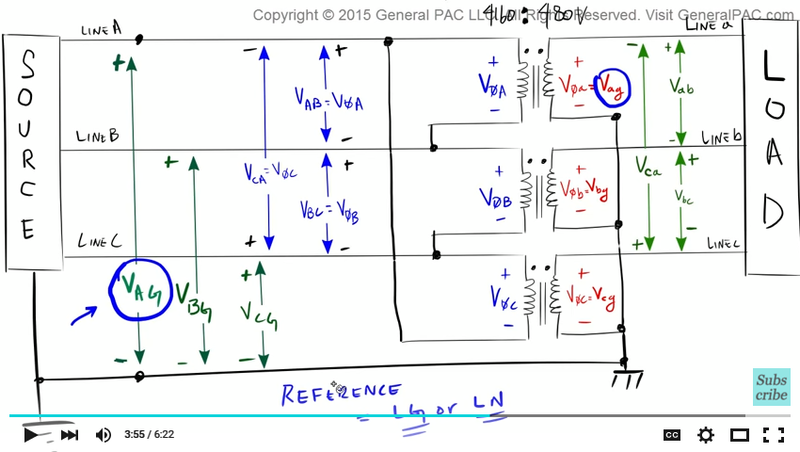 So the second rule of thumb – in terms of the transformer name designations are defined, we start at the HV reference quantity and we rotate in the Clock Wise direction until we reach the LV reference quantity. So let me repeat this again. 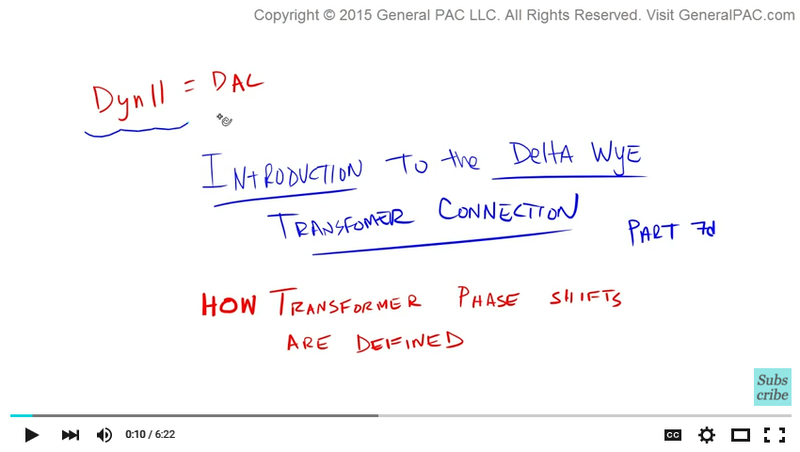 In terms of the how transformer name designation are defined, we're talking about the Dyn11 designation, we start at the HV reference quantity and rotate in the CLOCKWISE direction (this is a key word). 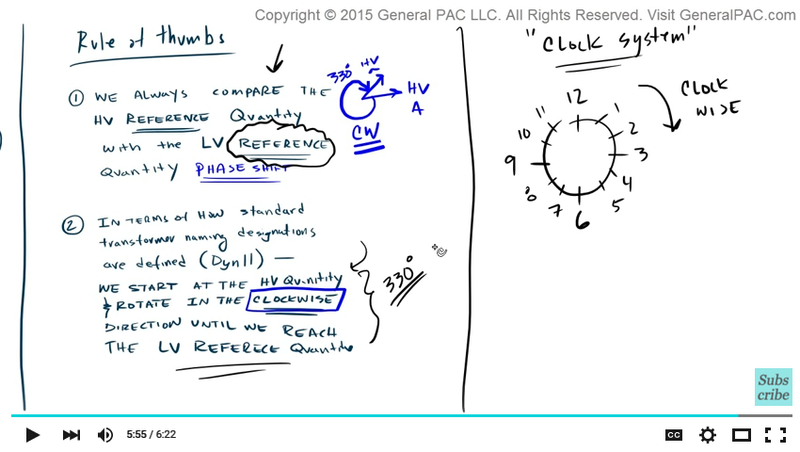 So we rotate in the clockwise direction until we reach the LV reference quantity. So what we're saying is that once we have this HV reference quantity for winding A. We rotate in the CLOCKWISE direction until we get to the LV reference quantity for winding a on the secondary side. So we rotate in the clockwise direction (its 330 degrees in our example). So in general terms, this reference quantity is always defined as the line-to-ground quantity or the line-to-neutral quantity. So on the HV side, VAG, VBG, and VCG are our reference quantities on the HV side which is the delta side. So when we're comparing two values, we have to compare apples to apples. So we use for the sake simplicity, we use VAG. So VAG is our reference quantity on the HV side. Now the reference quantity on the LV side which is connected in Wye is Vag. The voltage across line a and ground. So Vag is our reference quantity on the LV side. 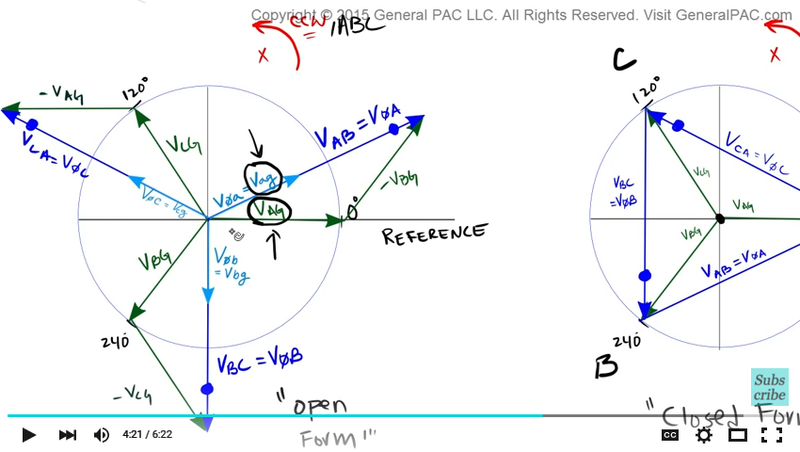 So when we're comparing the HV winding and the LV winding to determine the phase shift, we have to compare VAG on the HV side vs the Vag on the LV side. Now granted there are other quantities that we can compare but for the sake of simplicity and our rules of thumb, we're only going to compare the line-to-ground quantities. So what does that look in our phasor diagram? So what we're saying in our phasor diagram, this VAG which is our HV reference quantity, with Vag on LV side. 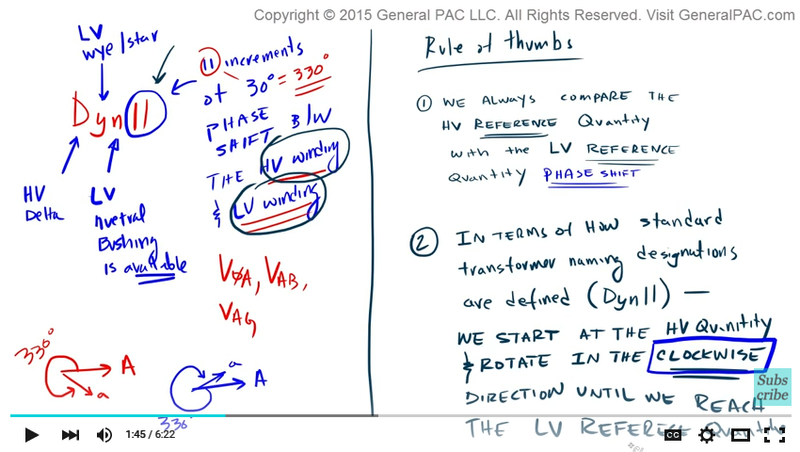 So we're comparing this HV reference quantity and this LV reference quantity to determine the phase shift. For this transformer connection, it's pretty obvious that the phase shift between the HV side and the LV side is 30 degrees right? But the question is, how this transformer designation does actually works with respect to our phasor diagram? And that's what we're going to cover in part 7e. So in this video tutorial, we looked at the two rules of thumb. The first rule of thumb is that we're comparing the HV and LV reference quantities. 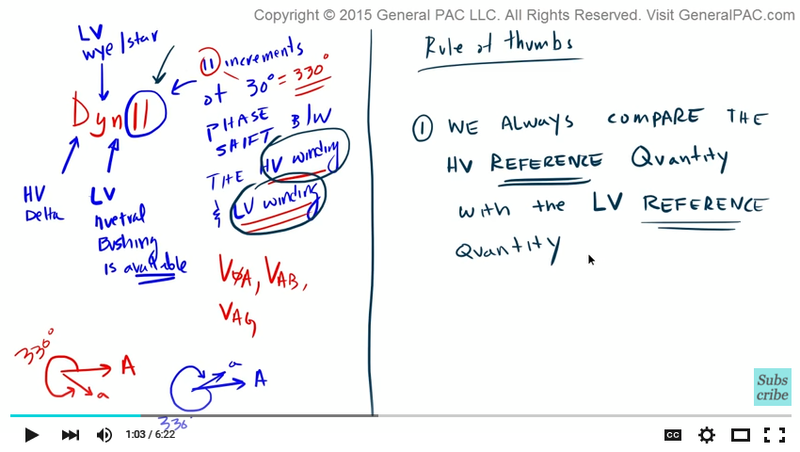 And the other rule of thumb is that when we are comparing it, we have to start at the HV reference quantity and rotate in the clockwise direction until we reach the LV reference quantity. So this right here is implying that we have 330 degrees phase shift. Now if you find this confusing, don't worry, I was very confused at first as well. But there is a very easy way to digest this information and that comes through the method of the clock system. And just to give you a quick peak of the clock system, is that you draw a clock then you have hours on a clock. And the hour hand obviously always moves in the clock wise direction. And we're going to look at how we can define this phasor diagram with this clock system and make sense out of this intuitively. And if you're like me who always comments and questions things, go ahead and leave your questions or comments below. This video was brought to you by generalpac.com. 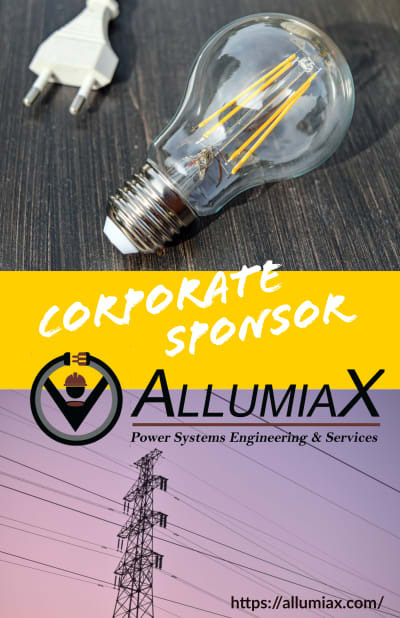 Making power system protection, automation, and controls intuitive.